Contains Hyaluronic Acid, Glucosamine, Chondroitin and MSM to help support healthy hip and joint function and to help alleviate aches and discomfort associated with daily exercise. 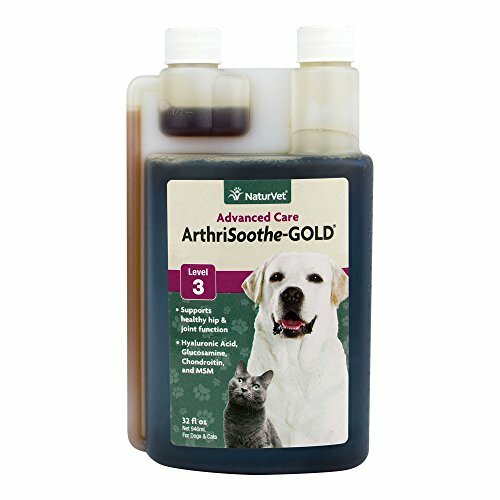 Perfect for pets in need of advanced joint care, such as senior pets and pets recovering from joint related injuries or surgery. Liquid 32 fl. oz for Dogs and Cats. Shake well before each use, recommended to double the suggested daily amount for the first 3 weeks. Active Ingredients per 1-½ Teaspoons: Glucosamine, Methylsulfonylmethane (MSM), Chondroitin Sulfate, Boswellia serrata, Yucca schidigera Extract, Hyaluronic Acid and D-alpha-tocopheryl acetate (Vitamin E).